What Happens if You Pay Your Quarterly Taxes Late? You have just received a notice in the mail from the Internal Revenue Service (IRS) saying that your taxes are late or have not been filed at all. To make matters worse, the notice says that you not only owe the taxes but they have included penalties and interest as well. Now what? Need Help With the IRS? Contact Our Team of Tax Accountants Today! We have, in our country, a system of paying taxes known as “pay as you go.” For most taxpayers, this is handled by their employer through a system of withholding. The burden of being a tax collector falls on the business. They must withhold all payroll taxes and remit them to the IRS (and possibly state tax agencies as well) on a quarterly basis. The employee has very little responsibility other than to file a tax return at the end of the year. However, some people are self-employed and therefore not employees. The pay-as-you-go principle still applies to them. Instead of withholding, though, these individuals must make periodic estimated payments. 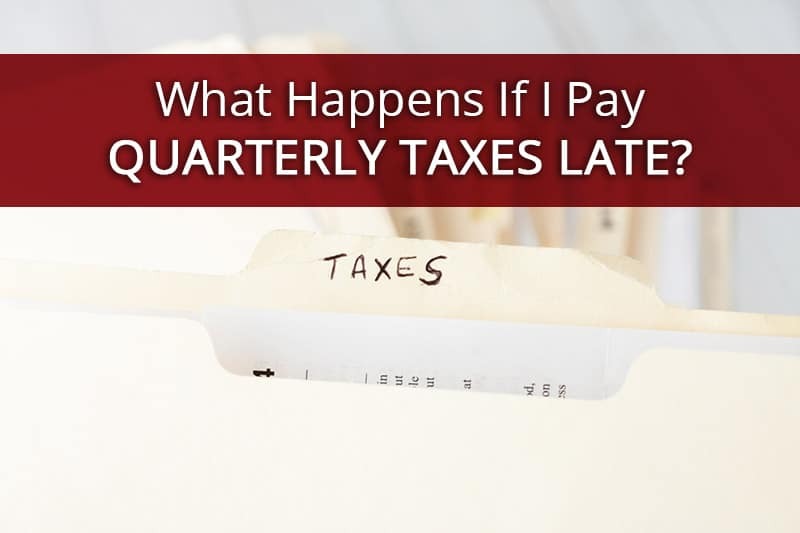 What Happens If I Pay My Quarterly Taxes Late? Quarterly taxes usually refer to one of two types of taxes—estimated income taxes or payroll taxes. Both businesses, depending on their structure, and individuals make estimated income tax payments on a quarterly basis. Only businesses are subject to payroll taxes, and those can be paid monthly, quarterly or annually depending on the size of the business. Payroll tax returns are filed on a quarterly or annual basis regardless of when the payment is made. Why is this important? The penalties for not filing a tax return are almost always more severe than those for not paying the tax. There are no real consequences for not filing an estimated tax form itself. Keep in mind that the federal government and various state and local jurisdictions all have different, specific rules in this regard. For purposes of this discussion we will focus on the IRS. Failure to file a tax return can result in a penalty of 5% of the tax not paid for each month or part of a month that the return is late up to a maximum of 25%. If fraud is involved, the penalty is more severe. There is no penalty for not filing or paying an estimated tax payment. However, when a tax return is filed, and it is established that there has been an underpayment of taxes because of insufficient tax withholdings or estimated payments, the IRS can assess interest penalties (recently in the range of 3-4%) on the amount of the underpayment. Again, these are general rules. A competent tax professional can advise on specific situations. The point is clear, however, if you don’t pay your taxes on time, the taxing agency involved can charge penalties and/or interest on the amount owed until it is paid. Furthermore, the type of tax involved can result in different types of responses from a taxing agency. For example, the IRS takes a dim view of businesses that don’t pay and/or file their quarterly payroll taxes and are far more aggressive in that regard than with the average taxpayer who forgot to make an estimated tax payment. The reason that the IRS is more aggressive with regard to payroll taxes is because they view that money as not belonging to the business but rather as money being held by the business for the IRS because it has been withheld by the business from the employees on behalf of the IRS through payroll deductions and withholdings (FICA, FUTA, Federal Withholding). In effect, businesses are the tax collectors for the IRS, and they are simply holding those funds in trust until paid to the IRS. As a side note, the worst thing a business can do is withhold these funds and then use them for “cash flow” because they don’t always have to be remitted to the IRS right away. They should always be withheld, set aside, and used for no other purpose than to be remitted to the IRS on time as prescribed by law. What Happens If You Ignore Quarterly Payroll Taxes? If a taxpayer continues to not pay taxes owed, they run the risk of more serious action such as levying of bank accounts and tax liens on their property. Dealing with these matters is far more costly and time consuming than simply paying the taxes on time! Can You Take Care of The IRS Yourself? Typically, the more serious the problem becomes, the more likely professional representation will be required. No taxpayer should take on the IRS by themselves although they are allowed to. Rather, they should engage a Certified Public Accountant, Enrolled Agent, or attorney and provide them with a Form 2848, Power of Attorney and Declaration of Representative. Why one of those three professionals? They are the only ones the IRS will allow to represent a taxpayer in any of these matters, provided they have been designated by the taxpayer on that form. The IRS and most other taxing agencies will work with a taxpayer to resolve the issue, but there is a process, and the taxpayer needs to face the issue and deal with the consequences in a timely fashion. Installment payments plans may be available and in very rare instances, an adjustment to the amount owed may be made. Ignoring the problem, however, will only make matters worse. Tax notices are unpleasant and worrisome. The simple solution is to avoid them by understanding, planning for, filing, and paying your taxes on time.